In the modern age, digital communications are utilized daily by a large percentage of the population. With seemingly endless social media platforms, daily emails, and business-related video chats taking over, one form of digital communication has stood the test of time: SMS messaging. It’s a simple, hopefully concise, message on the top of someone’s cell phone. Want to communicate with your clients with ease and respond accordingly? With SendHub, business leaders send outbound messages and receive inbound messages, including inbound MMS, from recipients, ensuring that you can speak directly with your clients when they need you most. Additionally, SendHub offers analytics and reporting so that your company has the graphs, insights, and usage analytics to measure the effectiveness of your bulk SMS messages. Business texting apps are imparitive for small businesses, churches, schools, financial institutions, ridesharing programs, delivery, logistics, and more. Email is a time of the past. Using a business texting app is a new way for organizations to get a message out and read, quickly. When you have a business texting service like this in place, it’s easy to keep in touch regularly, so you won’t let any important business information fall by the wayside. With SendHub’s business texting solution app, you can share important and promotional SMS messages with clients, vendors, and employees with ease. Our out-of-the-box SMS solution helps businesses craft professional text messages from one easy app, with no developer required. With Android and iOS applications available, you’ll have access to SendHub when you need it most. Simplicity is always something that business people look for, and the ability to communicate without the complexity will make your life a whole lot easier. For our clients who have an existing CRM or other software, SendHub can be integrated with ease by your web developer. By integrating these pieces of software, your company can build your own SMS solution to reach existing clients and employees with bulk SMS actions such as scheduled messages, group messages, and promotional messages. Automation is a key ingredient to a modern marketing plan. Save your company’s precious time with bulk SMS services, and spend time on what really matters: growing your business. With an effective business texting app in place, you will have many more options and opportunities with your marketing. 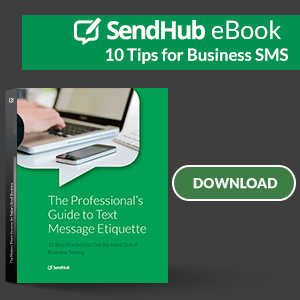 You will scale your business with SendHub which is the main reason your organization should consider a business texting app. At SendHub, we strive to help companies grow and simplify their communications. 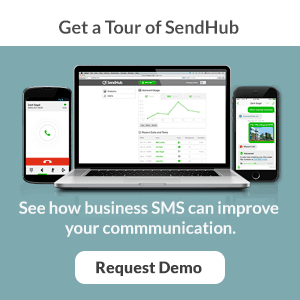 To see for yourself how SendHub can help your business, call our sales team to schedule a demo today. Call now at 844-990-4400 and press 1 for sales.